1917: William Friedman & Elizebeth Smith married. 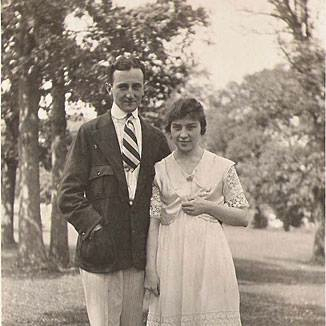 21 May 1917: William F. Friedman and Elizebeth Smith were married. This cryptologic power couple is well known for their significant pioneering contributions in the field of cryptology. Elizebeth S. Friedman is often referred to as (North) America's first female cryptanalyst. It was Elizebeth who introduced her husband to the field of cryptology. Although neither planned on a career in codebreaking, there were few ciphers that were indecipherable for the couple. William Friedman went on to be recognized as the greatest maker and breaker of secret messages. Much of what is done today at NSA can be traced to William Friedman's pioneering efforts. On 30 October 1992, the NSA's Center for Cryptologic History published, "The Friedman Legacy: A Tribute to William and Elizebeth Friedman" which includes transcripts of the famed "Friedman Lectures." To listen to the audio collection or view transcripts, click the link below. The George C. Marshall Foundation opened an exhibit, "Partners in Code: William and Elizebeth Friedman" in April 2015 as part of their Legacy Series: Codebreaking.